Suicide Forest in Japan is real. Enter at your own risk. 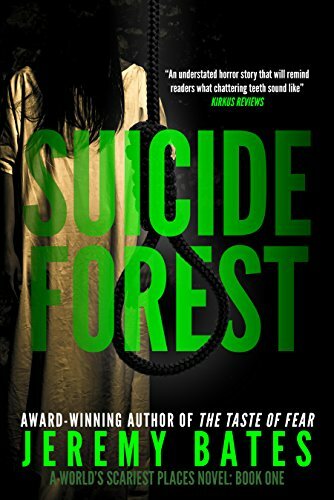 Just outside of Tokyo lies Aokigahara, a vast forest and one of the most beautiful wilderness areas in Japan…and also the most infamous spot to commit suicide in the world. Legend has it that the spirits of those many suicides are still roaming, haunting deep in the ancient woods. Q – So, who are your favorite authors and why? A – I grew up reading all the big names in horror like Stephen King and Dean Koontz and James Herbert and Clive Barker. I’ve also always enjoyed Bentley Little and Richard Laymon. Recently I’m getting into some new names like Bobby Adair and Joe Hill. Why do I like them? The answer to that is pretty simple. They write fantastic horror stories that check all the boxes: realistic characters, real chills, lurking dread, danger, lightning-fast pacing, plots full of twists and turns. And they also experiment with other genres, mixing horror with sci fi, psychological suspense, crime thrillers, and so forth. Q – What other books do you have available? Q – So, why should readers give these books a try? A – Because they are fast and fun and include quite a few surprises and scares (and the occasional touch of humor). Each book has hit the top ten bestsellers list in Kindle’s Suspense and Thriller categories, and each has been featured on Amazon’s Thrillers 100 Must Reads list. Hindered only by her raging crush on the office hunk, wannabe sleuth Lizzie Hart spies, accuses, and gossips her way to the truth in this bestselling first book of The Lizzie Hart Mysteries series!The sleepy town of Liberty hasn’t seen murder in…well…ever. 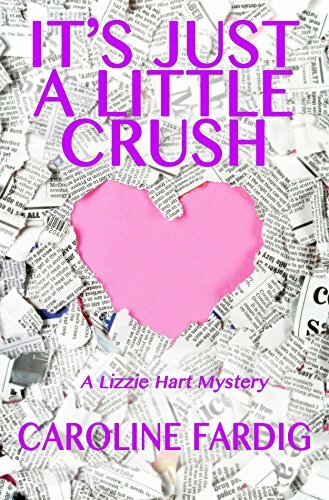 Residents are stunned when the body of a young woman is found strangled, and reporters at the Liberty Chronicle are thrilled, rather disturbingly, over the biggest news story to hit town this century.Lizzie Hart has even bigger problems. Lately, she can’t seem to concentrate on her job as copy editor at the Chronicle with the new hunky investigative reporter, Blake Morgan, swaggering around the office. How can a girl work when she’s using all of her energy combating Blake-induced hot flashes and struggling to repress the giggly inner schoolgirl that’s constantly rearing her dorky head? It’s a good thing that Blake barely knows Lizzie exists. After an odd string of events, however, Lizzie begins to wonder if Blake is really as fabulous as she has fantasized. When Lizzie and Blake find a co-worker dead, Blake’s personality changes completely–and not in a good way. Even though the police rule the death as an accident, Lizzie immediately suspects foul play and senses a connection to the recent murder. She is determined to bring the killer to justice, but is having some trouble getting her Nancy Drew on thanks to the pesky stalker she’s picked up–Blake Morgan. Wait, didn’t she want him to follow her around and pay attention to her? Not like this. Blake has turned from cool and smooth to cold and downright scary, making Lizzie wonder if he should be next on her suspect list. Josie spent twenty years as a battered wife, dying for a hero. Now, she’s dying to become one…Josie Kane is a “difficult” woman, a pure enigma – one who survives her abusive husband by honing her unnerving talent for playing mind games: she knows exactly how to manipulate a bully. Finally divorced, she thinks the abuse is over, and she’s free. She’s wrong. And her cynicism is building. Josie works with battered women, trying to rescue them from a fate similar to hers. But on the night that yet another battered woman is murdered by her husband, pining for a hero as she dies in Josie’s arms, her cynicism becomes a quiet, simmering hatred. Her one remaining refuge is in her bond with Maxine and Samantha, the two friends whom she loves like sisters. When Samantha becomes pregnant by Jack – an abuser who makes known his intentions to use the baby as a weapon of control – Josie’s hatred ripens to a vengeful fury. She sets out to take on one more batterer, manipulate one more bully… And she lures Jack into the crosshairs of the ultimate mind game. Her friends are convinced that she intends to rid Samantha of Jack. They’re right. But with Josie Kane, as always, there’s a twist. With her friends helpless to stop her – and with Samantha hanging in the balance – Josie squares off with Jack in a life-and-death, winner-lose-all battle of wits to determine which side will win Sammy’s future. And this time, there will be a hero. The epic story about a young mother, Marilyn Ledbedder, and her illegitimate son, Leon, who through unfortunate events were forced to leave their home in rural Arkansas. Taken in by a middle aged man and his wife in Louisiana, they settle in for seemed like a happy normal existence. Soon, many tragic events take place in Leon’s world, which takes away the serene life that he enjoyed. Witnessing a brutal attack on his mother, Leon plots revenge, not on just one perpetrator but also on another. Does he seek revenge or allow the justice system to run it’s course? Much of this story is told by Leon to his psychiatrist, thirty years after the fact, in hopes of regaining his sanity and freedom. Pre-Release Book Club Readers: “A spellbinding Page Turner” A survivor. A soulmate. A secret.High school senior Amanda Michaels suffers amnesia with regard to everything before the jet crash. She loses her parents and her memory in the aftermath, but miraculously survives. While recovering, Amanda strikes up a whirlwind romance with a young hospital volunteer, but only recalls a haunting series of flashbacks of her near death experiences (NDE’s). Meanwhile, her uncle, high profile DC trial attorney Andy Michaels represents her and the families of numerous passengers against Hemispheres Airways. 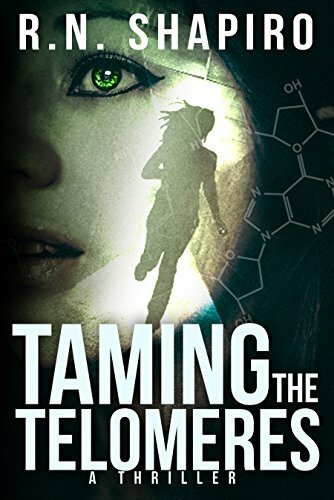 What to expect inside “Taming”:Explore the medical mysteries behind NDE’s;Why cell telomere medical research is worth billions to the world’s superpowers;Peeks inside the USA’s top secret Foreign Intelligence Courts;Picks up where Edward Snowden’s spying leaks left off.˃˃˃ Spying. Covert Ops. Cover-up at the highest levels?As the major monetary settlements with Hemispheres are looming, both Amanda and her uncle Andy stumble onto evidence of possible sabotage of the jet and a link to her dad’s classified biological research on cell chromosomal telomeres. Why was her dad’s research so valuable? Once Amanda learns she may possess biological secrets that competing intelligence agencies will kill for, she has no idea who to trust, unwittingly caught up in a web of biological espionage. Amanda’s personal roller coaster ride explores romance, heartbreak, depression, persistence and ultimate redemption. The fast paced story moves between Middleburg, Virginia horse farms, Washington, DC, New York city and points between. A series of stunning twists unwind along the path to the unforeseen climax.˃˃˃ If you’re a fan of Clancy, Connelly, or Grisham thrillers, “Taming” is a must read.Special Amazon E-Book Limited Time Discounted Price.The discounted Amazon sales price is set to expire soon, and applies to the E Book version only.Scroll up and get your copy today. 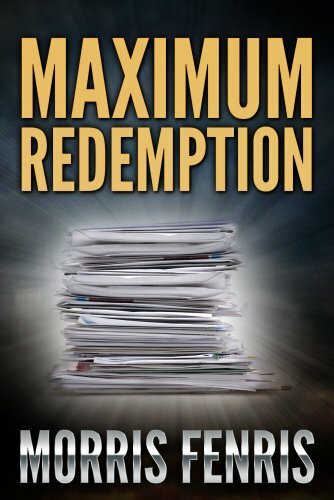 Maximum Redemption is a thought-provoking drama about redemption. It is a Christmas story of hope, of human kindness and forgiveness, of mistakes, altruism and regrets. It is engaging, entertaining and surprising – a suspenseful crime thriller that’s filled with twists and turns. The arrest of Maxwell Sheppard, internationally renowned and despised conman, made worldwide news. Max made a fortune duping the mega rich with an ingenious Ponzi scheme, but then his luck ran out. As part of his punishment, the district attorney forces Max to read letters from people he’s hurt and respond to each of them. One of these letters, penned by a teenage boy, stuns him and sends him on a quest to right his wrongs; to save a small town of hard working, innocent people from losing their homes. “Funny and suspenseful story that is really several mysteries in one, with more than enough twists and turns. Fenris is a masterful storyteller, and in Maximum Redemption he examines a criminal with a personal code, what is the nature of punishment, and how to right the wrongs our actions create. You won’t know who to trust or where everything is leading. Max lead a Ponzi scheme that bilked the rich, and his brother got away but he ended up in federal prison. There he begins acts of reconciliation and redemption, and when he learns his actions hurt actual working people he feels a need to make right on his crimes for the first time. He has a huge leverage card because the feds haven’t found his hidden money yet. What follows is a pageturner where we don’t know how the innocent families were hurt in the first place, where the money is hidden, how he can help them in time before Christmas, and what the end result will be. “A good read! An easy to read crime thriller. The main character, Max, is a real smart bloke and he has figured out how he can make billions, but his next challenge is how to keep it and not be jailed or killed in the process. With his quick wit and well thought out plans, he manages to bring this about, but along the way he finds out that hundreds of people in a small town are going to be harmed by someone who has basically hijacked his system. These people are going to lose their homes a week before Christmas. It was never his intention to harm everyday workers. His targets were those who could afford to lose millions and not be financially inconvenienced. Arkansas sisters Jenna Stafford and Carly Reece share a dry wit, an unshakable faith, and a regrettable tendency to happen across murder. . .When Carly’s paperboy son is accused of killing the newspaper editor, Jenna and Carly go undercover to get the scoop and clear the teen’s name. But stop the presses! Will the next headline feature them exposing the real killer? Or will the sleuthing sisters end up in the obit column?ABOUT THE AUTHORS:Sisters Christine Pearle Lynxwiler, Jan Pearle Reynolds, and Sandy Pearle Gaskin are usually on the same page. And it’s most often a page from their favorite mystery. So when the idea for a Christian cozy mystery series came up during Sunday dinner at Mama’s, they determined to take their dream further than just table talk. Thus the Sleuthing Sisters mystery series was born.Christine sold her first story in 2001 to Barbour Publishing and since then has written many award-winning novellas and novels, including CBA bestseller Forever Christmas and the highly acclaimed McCord Sister series. Christine and her husband, Kevin, live with their children in the beautiful Ozark Mountains. Sandy, retired teacher, works with her husband, Bart, managing their manufacturing business. The Sleuthing Sister series is her first published work, but the only thing she enjoys more than reading a good mystery is plotting and writing one, so there are certainly more to come. Jan, office manager, and her husband, Steve, love to spend time with their two adult children and their granddogs on the lake or just relaxing at home. Death on a Deadline, Drop Dead Diva, and Down Home and Deadly are her first published works, as well. Like Sandy, she loves not only to read, but also to plot and write, and already has several other book ideas in mind. COVER:Photography by Megan Reynolds of Meg’s Photos. REVIEWS:”I will tell you if you pick up the book you won’t want to put it down until you finish it. 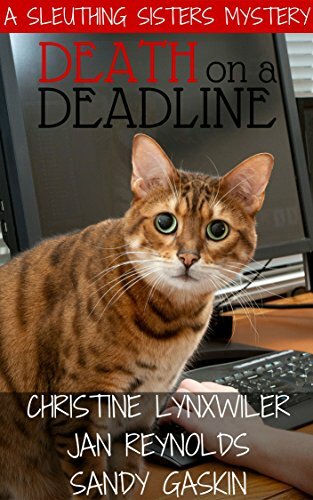 Death On A Deadline, authored by Christine Lynxwiler, Jan Reynolds, & Sandy Gaskin is warm, witty, and at times funny as a cozy mystery should be. And with a Heartsong title you’re sure to find romance. Death On A Deadline has a splendid one. The mystery is well written in a wonderful voice keeping you turning the pages. You’ll find the characters are warm and genuine, just as you would imagine the residents of Lake View would be and the relationship between the sisters as enjoyable as the mystery” ~ Suspense Zone reviewer, Susan Sleeman”Death on a Deadline is a Sleuthing Sisters Mystery written by sisters, Christine Lynxwiler, Jan Reynolds and Sandy Gaskin. The first mystery in this series, Death on a Deadline stars sisters Jenna Stafford and Carly Reece. Carly’s son Zac stands accused of killing his boss, a newspaper editor.Death on a Deadline is a fun, cozy mystery that keeps you in suspense until the very end. A great pace and quirky fun dialogue makes this cozy very enjoyable. Jenna and Carly make an enjoyable sister/sleuth combination who work well together and who seem to enjoy being sisters. Death on a Deadline is a funny book, with a humorous heroine who sticks her nose into everyone’s business and who doesn’t mind going around collecting “evidence” which she then presents to a very reluctant police chief. 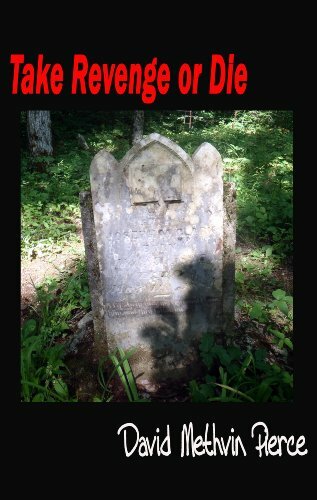 There is a little romance in this book, with Jenna and Alex renewing their friendship; just enough to tease the reader and make them want to continue reading the series to see what becomes of their possible romance.Death on a Deadline is a strong first book in the Sleuthing Sisters Mysteries. The other two books in the series are: Drop Dead Diva and Down Home and Deadly. Death on a Deadline is a pleasant, entertaining, easy read, and should appeal to people who love cozy mysteries entwined with a bit of romance.” ~ Helium reviewer, Wendy R.
Jake Walker has pressures coming at him from all sides. A long-time homicide detective for the city, he’s also a divorced father of three kids. With the kind of work he does, family life often takes a back seat. This is certainly the case when the bodies of the most outstanding players on the State College football team start being discovered brutally murdered. Why would anyone want to murder these guys? 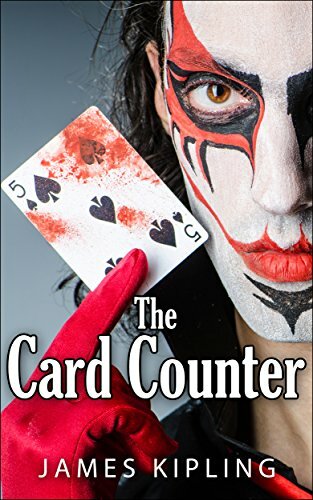 Detective Walker has to put family and everything else aside to solve these crimes before anyone else falls victim to this vicious killer the press is now calling “The Card Counter”. As each victim turns up, the case becomes more traumatic and bizarre. The killer has a point to make and will continue to make people pay with their lives . . . until Walker and the rest of the city GETS IT!! Find out who is murdered next and follow Detective Walker until he uncovers the truth behind these killings, the twisted motive for this murderous rampage. “Brilliant and riveting book! James Kipling has once again mastered his method of throwing the reader straight into this dark fantasy right from the start. 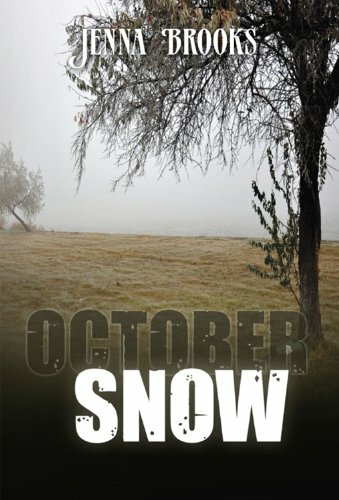 An excellent detective story creatively wrapped into a mystery and suspense thriller. Extremely well written. Crime and Mystery fills the pages as dead bodies are found all over the place. An intellectual murder and mystery thriller as this detective does what he does best adding being a good father to this weird thought thrilling equation. “This is a great pick when you need an intellectual puzzle, a suspensful thriller, and crime fiction with the thread of revenge running through it. The procedural is written in the first person, so we really get to know Devon, and that’s a great thing because he’s a cool guy. I liked his devotion to fatherhood, especially since we don’t have near enough serious genre characters who are also dads. Through his eyes we understand the high personal stakes he brings to all of his work, and especially to this case involving murdered students. I loved the way the relationship with his own daughter Cassie aids his work both as indirect inspiration and also directly. Big points to Kipling for pulling off those unique scenes. Kieran Kelly’s world turns upside down when his wife’s health is devastated by an epidural in childbirth. Incensed by damning evidence of medical and pharmaceutical misconduct, the tormented former IRA hit man plots revenge against those he deems responsible, including a government that doesn’t seem to care. Kelly’s quest brings him face-to-face with an alcoholic physician, an altruistic scientist and a corrupt government minister – but not before the love of a stunningly beautiful but crippled Countess makes him question his motives. He meets Countess Magda von Esterhazy at a meeting of a self-help group for victims of the uniquely painful iatrogenic (doctor-caused) disease that struck down his wife. Magda awakens feelings that he thought he had lost forever. Meanwhile, one of Kelly’s targets, scientist Jonathan Tring, finds himself embroiled in the Machiavellian machinations of his boss, the gruff and corrupt owner of a pharmaceutical company, and the man’s stunning young American wife. In all the mayhem, Tring, too, finds love – and desperately wants to live to enjoy it. 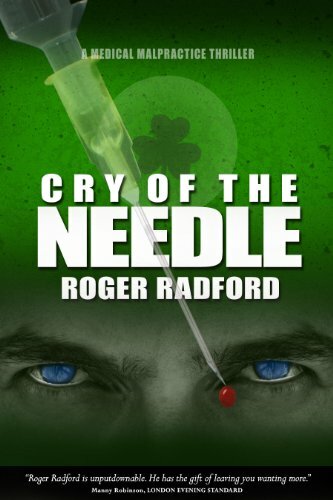 Cry of the Needle is a searing tale of love and vengeance. Revenge that is a dish best served Irish. “I really LOVED this story! The characters are amazing and the interactions were flawless! Darwin Winters, reluctant pet psychic, is determined to leave her family’s paranormal past behind and lead a normal life. So she strikes out on her own and opens up a new pet boutique in St. Pete, Florida. When a local homeless man she befriends is found dead, and the police assume it’s a suicide, Darwin has no choice but to use her gift to help collar the killer. 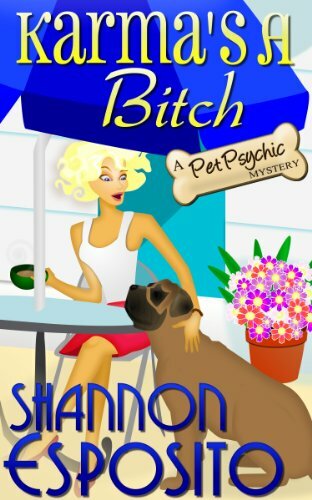 She adopts his grieving mastiff, Karma—and with the dog’s help—tries to piece together the events of that fatal night. Accepting the visions is one thing, but can she solve the mystery without revealing her powers to the jaded, yet drool-worthy, detective in charge of the case? Or will the killer put an end to her psychic sleuthing and bury the truth for good?